There’s a few places we like to take friends to visit along Çalış Beach, and these are also places we like to visit randomly whenever the mood takes us. Fethiye Surf Centre has been a constant of our time around those parts. Before other places popped up, we used to go to that area with a friend in her car. 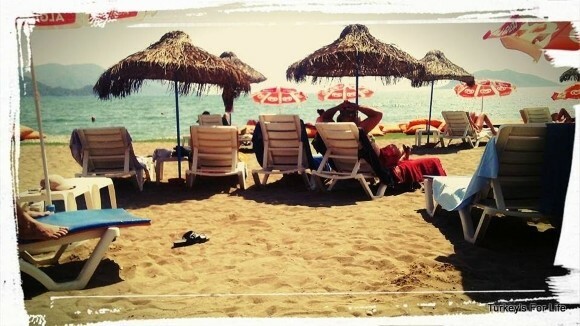 After the end of Çalış Beach, that was it. End of road. The car would crawl along the pebbled beach track, made firm because of people passing through it, but in winter it was often impassable unless you had a 4-wheel drive. The puddles would be sea ponds. We would be going to Birlik (which is now Mekan) or further along to Karataş to make a beach barbecue. And the only other business we passed on our way there was Fethiye Surf Centre with its logo, ‘Children Of The Wind.’ We all used to talk about the name. We liked it. “A surf centre or something,” our friend told us. We all just liked it, it felt good, a nice idea, a great name. But it was just a passing point. Let’s just stress, none of us are potential windsurfers / kitesurfers – although Barry does ponder it occasionally, and the day will come, no doubt, when he just decides today’s the day. So, this photo is taken from Mekan (previously Birlik), last summer, when we were there with another friend. That was when we wrote a post about our happiness at the sight of the baby flamingos (as you can see in the photo). But what you can also see in the photo are the kitesurfers. Add a bit of breeze to Koca Çalış (and there’s breeze much more often than not in summer for these parts) and you’ll see the kitesurfers. And we love to watch them. I even look a bit longingly at them and think, “I want to be doing that,”…and then I jolt back to the reality of it: me and water activities are just a no no. I don’t even like the waterslides at aquaparks! Speed – water – underwater – errrm, no thanks. But the sight of them…the sight of them…it is exhilaration and relaxation all rolled into one. Fethiye Surf Centre and Surf Cafe are on Koca Çalış Beach and are the last stop for the Fethiye-Çalış dolmuş so you can easily reach them. Surf Cafe is open all year. If watersports are your thing or you’d like to try some lessons, the surf centre does kitesurfing, windsurfing, catamarans and dinghy sailing. If watersports are not your thing, Surf Cafe has free sunbeds, there’s a full bar, food is available…and you can just watch what’s going on from the comfort of your bed or bar stool.